The trip had started on an upbeat note. By the time that George, Ray, Susie and I had landed in Seattle Friday morning, the weather seemed to have cleared from a previous storm. After a stop at the Pike Street Market for a blackened Salmon sandwich, and to pick up some smoked salmon for lunch the next day, we headed over to the REI Coop, Mecca to all self-propelled outdoors types. We had just missed the opening of the new Flagship Store in ‘96 by a few days on the Bailey Range trip, and we weren't gonna let that happen again. After spending the afternoon crawling inside of numerous tents, we decided to let our $300+ dividend burn a hole in our pockets a bit longer, and headed over the Ivar's Salmon House for dinner. Do we detect a theme here? Watching the weather from our motel room in Everett that night, I got a sense of the size of the storm into which we were heading. The jet stream had a huge dip in the western US, and the storm system accompanying it seemed nearly a thousand miles across. While Susie was in the bathroom, getting ready for bed, the local weather guy was warning folks that the snow line would be around 5500 feet, and if you were not prepared for winter conditions, don't go out. Boy, what an auspicious start. Saturday was a transition day for us. 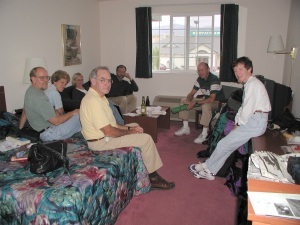 The only thing we had to do was to drive to Omak, Washington, to gather the rest of the crew. Tim and Diane had flown into Spokane late Friday nite, and Andy and Sue had flown to Portland on Thursday morning, and were visiting some of his relatives in Eastern Oregon. We awoke in Everett to leaden skies, and much cooler temperatures. Since there was no real hurry (I could sense that George and Ray were itchy to get on the road, altho it was not clear to me what the attraction in Omak might be), Susie and I went out for a jog through one of the local subdivisions. After a modest continental breakfast, we all headed in two cars up I-5 toward Rte 20, the North Cascades Scenic Highway. It wasn't long before the rain started. We gathered at the one of the Park Visitor Centers, for a bathroom break, and showed to the person behind the desk a photo of Susie, with Scott and Carolyn Heppel, in the map of the North Cascades that the Park Service gives out. Ray and George bought trailhead parking permits with their senior discounts, saving us all some money. They would buy two more at the official North Cascades Visitor Center, which was our next stop. It was amazing: here it was, Saturday of Labor Day weekend, and there might have been 20 people wandering around the Visitor Center. I commented to the attendant that from whence we come (the Smokies), there would be hundreds of people in the Visitor Center today. She pointed out that the North Cascades is the second least-visited Park in the lower 48, after Isle Royal. And that is only because for the latter, the sole way to get there is by boat across Lake Superior. George and Ray got ahead of us, and out of sight near Newhallem, and after getting behind the RV Caravan from Hell, we decided to stop for lunch near Wahington Pass, in the shadow of Liberty Bell (if there had been any sun). At the elevation of the pass, it was, in a word, nippy. Susie and I dined - to the extent one can "dine" when they are crammed in into the front seat of a rental car - on smoked King Salmon, some wonderful sourdough bread, Tilamook cheese, and a nice Merlot. We sat in the car because of the temperature. I tried to be optimistic, imagining that the clouds were getting thinner as we headed east. It was a bit of a stretch. We caught up to Ray and George in Winthrop, miraculously, just as they were pulling out of the place that they had eaten there, and continued to Omak, arriving just after Tim and Diane. There was the usual round of hugs and handshakes, and introductions, since George had never met our friends from Tucson. Since Andy and Sue were due to arrive at the motel at 6 pm, "cocktails" - consisting of more wine and the remaining cheese and smoked Salmon - seemed to be in order by 5:30. After lots of wine, even the sprinkles outside didn't seem so bad, but I had the sense that it was snowing at the higher elevations. By the time A&S arrived, the salmon was just about gone, but they did get a couple of bites. It was off to dinner, at the Whistler Family restaurant next door, where nearly half the crew seemed to go for the grilled chicken or shrimp Caesar Salad. The impending lack of fiber seemed to be on everyone's mind. There was a sense that everyone was trying to be as upbeat as possible, despite the forecast. The optimism wasn't catching for Susie.